This entry was posted on Friday, July 22nd, 2011 at 13:02 and is filed under Media. Will the Real Pinhead Stand Up? It’s not often that Mr. O’Reilly turns against his populist mantra, and when he does, it’s ordinarily because he’s listening to such well-respected conservatives(inside Washington DC) as Charles Krauthammer, and Bill Kristol, or George Will. The fact that these folks are plugged into the DC establishment never bothers O’Reilly, even a little, and it’s a further demonstration of his willingness to dismiss the very ‘folks’ he claims he exists to serve. He’s also become more hostile toward Sarah Palin in the last several months. I agree with Mark Levin: We need to make careful decisions about who we watch because we don’t want to inadvertently support people who are opposed to our values. Then, to top it all off, while Bill O’Reilly slams the TEA Party for their support of Cut, Cap and Balance, NewBusters reports CNN releases polling data that shows 66% of Americans support Cut, Cap, and Balance, and 74% support a Balanced Budget Amendment. This is amazing! Bill O’Reilly likes to pretend he’s ‘all about the folks,’ but in truth, he’s all about only one thing: Tending to his gigantic ego. In point of fact, here he had a chance to side with ‘the folks’ and instead chose the DC insiders. If you’re still watching Bill O’Reilly, you might ask yourself why. 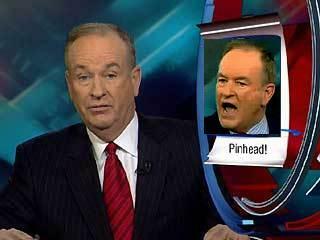 7 Responses to Bill O’Reilly: Professional Pinhead? Yes, you've hit the nail on the head. I've been seeing a change in Fox, especially sense Beck left, O'Reilly's talking points was the last straw. Emailed FNC said they've lost me for good also posted it to my Twitter account (kerf1911). Makes you mad when someone that you thought was halfway on your side tosses you right under the bus. Haven't been able to watch Billyo since Sarah slapped him down and he turned on her. He is so full of crap. I stopped watching BillO a very long time ago when I saw the immediate change in his puffed up ego right after his first visit to the Obama occupied White House. He is not our friend. WOW that rant was amazing!! levin got everything exactly right. i really hope o'reilly listens to this. I sent Bill an email saying "it was nice knowing you." The really stunning part was when he then followed-up with "the Tea Party is pig-headed" the next day. Thanks JT!